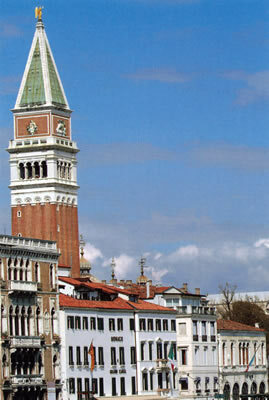 Everyone who stays in Venice – particularly when it is a first visit – wants a spectacular view. Of course, La Serenissima offers gorgeous views at every street corner. But we all know which is the most desirable: the view of the Grand Canal. The Hotel Monaco & Grand Canal therefore has a head start in the race to win the cup for the city’s most popular hostelry. Through its windows can be seen the gorgeous watery highway which captivates the world. On my first encounter with Venice, the boat from the airport sailed slowly down the Grand Canal. Nothing I had seen hitherto had prepared me for this feast of beauty. Indeed, I do not think that, before that moment, I had believed that humankind was capable of producing so perfect a panorama. That was over forty years ago. I have returned to Venice many times since, but I am still thrilled by this visual feast. To stay at an hotel which offers this joy from my very own window morning, noon and night is therefore a privilege. 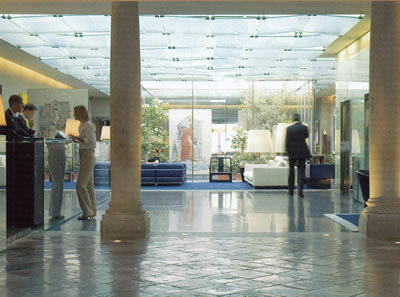 The hotel’s ground floor has a smack of modernity about it, for the reception area which joins the two ancient and elegant palaces is a confection of plate glass and metal. Do not be afraid to wander about, as I did, in the rear building. 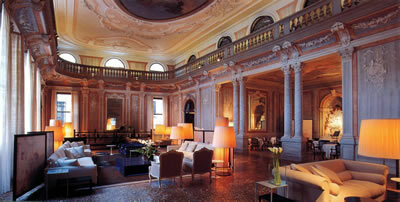 On its first floor is a large saloon, the Sala del Ridotto, full of stucco, marble and lovely frescoes. It was once, I believe – in the time of Casanova – what my Auntie Maud would have called “a gambling den” and what more modern persons term a casino. When the acqua alta was doing its worst during one of my stays, I was obliged to breakfast in these palatial surroundings. But I think the water is nowadays kept at bay more effectively, so that guests do not need to break their fast upstairs. My room was number 228, on the second floor. It was a “Double Deluxe Grand Canal View”, a designation which gives a clue as to its most significant asset. (For the price for a specific date you will need to check the hotel’s website.) From its two windows I could see a painting (for surely it was too perfect to be real), framed by two of the most beautiful churches in Venice: to the left the calm Classicism of Palladio’s San Giorgio Maggiore, and to the right the fantastical Baroque of Longhena’s Santa Maria della Salute. Inside my L-shaped chamber, the walls were covered with yellow silk, the floor was of polished wood and the lighting was provided by a chandelier and wall lights of Murano crystal. The bed, which had been made delightfully soft at my request and which boasted impressively crisp clean sheets each day, had a stylishly carved headboard. There was also sufficient space for a two-seater sofa and a modestly-sized writing table. In the fitted wardrobe was a private safe and in the small, yellow bathroom were two wash basins, a loo, a bidet and a tub with a shower over. 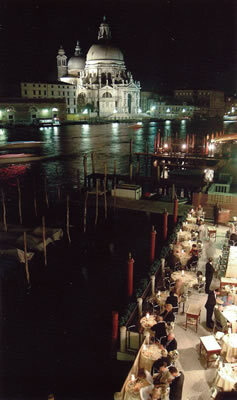 The dining room of the hotel is regarded as one of the finest in Venice. The Grand Canal Restaurant is on the ground floor, but it also offers the visual wonders I had found in my second floor apartment. Here I was looked after very well, not only by maitre d’ Domenica Melazzi, but also by the friendly waiter, Johnny. I settled back into the fauteuil (made comfortable for my ailing back by an extra cushion), surveyed the yellow tablecloth, on which the flame of the single, tapered candle was caught in the crystal of the Schott Zwiesel glassware, admired the soft reflection of the overhead spotlights on the silk-covered walls, and a smile settled upon my face. Before me, through the window, was the glory of Venice. With its gentle formality, good cooking and remarkable location, it is no surprise that the Grand Canal Restaurant is very popular. You should therefore book in advance. Its waiters, in black tie, work hard to keep the diners happy. Certainly, I found the service entirely to my liking. The members of staff always seem proud of the food they bring from the kitchen. 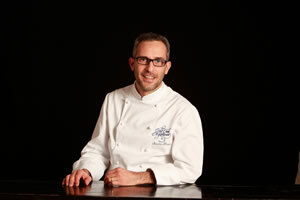 And they should be, for Chef Sandro Traini (pictured) offers a most attractive menu. This is a place for those – and I am among their number – who like straightforward Italian dishes cooked with real skill and flair. The wine list has 124 offerings. Most of them are, of course, Italian, but there is a sprinkling of temptations from France and elsewhere (2007 Chaeau Musar from the Lebanon is 107€ and 2004 Riesling Auslese, Clemens Busch, is 127€, half). Prices run from 25€ for a bottle of prosecco to 322€ for Mr Gaja’s 2005 Barbaresco and 327€ for his 2009 Darmagi cabernet. There are some lovely super Tuscans: 2010 Ornellaia is 202€, 2011 Tignanello is 167€ and 2006 Solaia is 302€. Champagnes include 2004 Dom Pérignon (256€) and Krug Grande Cuvée (291€). Those with a sweet tooth will be pleased to find 1997 Yquem (267€, half). For my own drinking, I relied on the advice of the waiter, Johnny. He recommended a most excellent Tuscan red – a blend of cabernet, syrah and petit verdot – which was packed with dense blackcurrant flavour and tantalised my palate with intriguing hints of strawberry. It was magnificent drinking for only 45€ (Il Toro, 2010). It was back to the restaurant for breakfast each morning. These were civilised occasions, with the gondoliers bobbing about on the glistening water outside. I liked particularly the fresh fruit salad on the buffet, so I added it to my bowls of Allbran, to my plates of cooked ham and to my slices of jam tart. I also secured helpings of bacon, tomatoes and scrambled eggs, croissants and pain aux raisins. To my table the waiters brought silver pots of coffee, buckets of ice cubes and – of course – my concluding cappuccini. 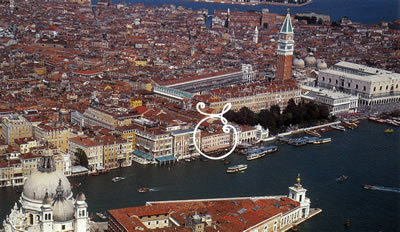 The Hotel Monaco & Grand Canal provides the Venetian view everyone desires. 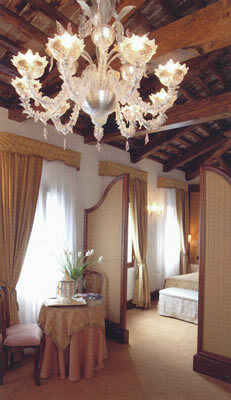 But it also provides so much more: comfortable accommodation, wonderful food and courteous service. It is a winning combination. Calle Vallaresso 1332, San Marco, Venice 30124, Italy.